It’s been quite some time since I’ve posted to this section of my blog, but the reason for doing so is to sing (and bring) the praises of the Apple Watch. Since it’s inception, and as of a month ago (specifically), I was determined NOT to purchase one, strictly because of it’s price point. I come from the world of Pebble, and have been using that watch (still do) for the past two years of so. Interestingly enough, FitBit in December 2016, purchased the intellectually property of Pebble. Many called it the death of Pebble, however that proved not to be so. My concern is after December 2017, FitBit will no longer maintain the Pebble servers. What that means, in actuality, is that the voice-to-text and native weather features will cease to function. The Pebble community has risen the call to keep Pebble alive, via a group of developers called Rebvle.io . They (at the moment) will continue to develop software on the Android platform to sustain the Pebble ecosystem. That is good news except there has been no such movement on the iOS side – which means that as iOS version upgrades evolve, incompatible with Pebble’s ecosystem will occur. There as already been some small incompatibility hiccups since iOS 10, but nothing major (seems iOS 11 beta is even working fine). That said, being an Apple fanboy since the late 90s, I started actually using the Nike+ Fitness app on an iPod Touch to track my running. Between 2010 (my first real interested in running) through 2013 or so, it worked well enough to allow me to get a good view of progress over the years. Since then, it has evolved both into the Nike Run Club and Nike Training Club apps. As for the Apple Watch, I knew that tight integration between Watch OS and iOS would never be an issue. This, in itself, caused me to make the purchase decision (in addition to having a zero balance on my Best Buy card LOL). I decided on purchasing the 38 mm Series 1 after a great deal of research. It had everything I needed at the price point I wanted (I take my phone with me everywhere and don’t swim to the point where I need to track swim metrics, so I didn’t need onboard GPS or waterpoof capabilities). 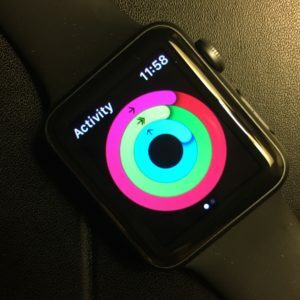 I knew very little about the fitness features via the Activity app when I purchased it, but seeing that I’ve been more on the fitness bandwagon than off, throughout life, the fitness features immediately began to appeal to me, the more that I learned about them. The motivation to “close those rings” is a very real thing to many, self included, however I’ve learned that this motivation means different things to different people. For me, I’ve learned that this ring closure concept, along with how the Activity app is integrated with the Health app, has given me a new and greater understanding on how regular and consistent fitness is extremely important. The rings themselves has strangely strengthened my desire to make fitness a routine and part of my daily regimen and that is definitely a good thing. I will say that I’ve learned a great deal about AW’s main competitor, FitBit. Though I’ve never been part of the community, I’ve learned that there are major differences between that of AW and FB. While I won’t get into that comparison here, I will say that for me, AW (and even the community as it currently is), is right for me in all aspects. Anyway, you slice it, the bottom line is what works best for you as an individual, and in the end, it all boils down to keeping fitness as a routine in your daily life. This entry was posted in Apple, Fitness/Training/Nutrition and tagged apple watch, fitness, training. Bookmark the permalink.